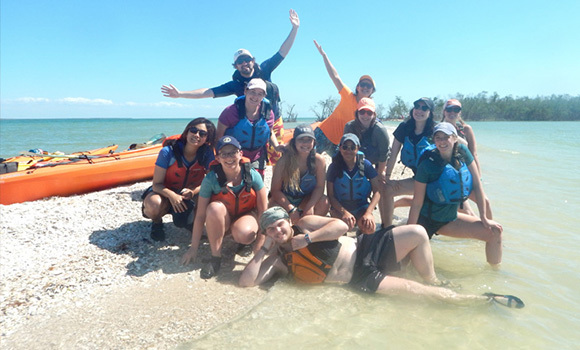 On a sea kayaking trip to the Florida Everglades in March, students in UNCG's Outdoor Adventures program paddled out to Keewaydin Island for lunch, swimming and some relaxation. It’s hard to miss: The towering 54-foot wall with colorful grips sprouting from the basement floor of UNC Greensboro’s Leonard J. Kaplan Center for Wellness. The indoor climbing wall, Adventure Trips and Rental & Trip Center (outdoor equipment rental) are the three components that make up UNCG’s Outdoor Adventures program. Greensboro may not be considered the mecca of outdoor recreation, but Spartans with a thirst for adventure will find everything from camping equipment rentals to educational backpacking and stand-up paddleboard yoga trips through the program. Students, faculty and staff are eligible to take advantage of the rental center, climb the indoor wall and participate in trips. Students and Kaplan Center members climb free and can bring up to two guests for an $8 fee (per guest). The wall is modeled after Pilot Mountain, a 2,400-foot peak in the Yadkin Valley. Routes are set up for beginner to advanced climbers, and the atmosphere is a positive one. “There’s a culture of trust and acceptance,” said Nathan Rector, assistant director of Outdoor Recreation Programs. It’s a culture that translates to all aspects of the program, which is focused on promoting healthy, active lifestyles, enhancing environmental awareness and technical outdoor skills and fostering a sense of community. The trips portion of the program offers outdoor adventures like sea kayaking with manatees, sailing, backpacking, outdoor climbing and whitewater kayaking, as well as service-oriented trips such as stream clean-ups and trail maintenance. In a large warehouse-type space that seems to extend for miles underneath Kaplan, the Outdoor Adventures program houses a full kitchen (they bake their own granola bars), washing machines, a fleet of kayaks for river and sea, sewing machines and even a stack of firewood. Around the corner from the climbing wall, a bookshelf with guidebooks and maps serves as a resource center for Rector’s staff. They’re encouraged to use equipment and scout trip locations to stay knowledgeable for any inquiries. “We are a hub of knowledge for this area,” Rector said. Rector said people may be surprised to know they don’t have to travel far outside of the city to find refuge in the outdoors. Paddling on the Haw River, hiking at Hanging Rock State Park or on the Appalachian Trail at McAfee Knob in Virginia and multi-pitch rock climbing at Stone Mountain State Park are all within a day’s drive of Greensboro. No equipment? No problem. The Rental Center has everything needed for a multi-day trip to the backcountry (tents, sleeping bags, stoves, backpacks) and other items like coolers for tailgating or a quick fishing trip. In the fall, the program runs weekly kayak pool sessions on Wednesday evenings in the Kaplan Center Natatorium for all skill levels. All Outdoor Adventure trip leaders must go through a one-year training process including an academic course, and Rector said a lot of the students learn about Outdoor Adventures through the Spartan Outdoor Orientation program for first-year students. In the works for next summer? Rector is leading a 26-day backpacking trip to the Himalayas. Registrations can only be made in the Outdoor Adventures Office, and many of the trips sell out quickly. Staff recommend arriving at noon on Monday, Aug. 13 to secure your spot.